Time to come out. This feels good. Wait for it. Deep breath. 'I'm a Vee-Dee-Cee.' Phew. That wasn't so bad. Vee-Dee-Cee (VDC) is an acronym-type-thingy for 'Vaguely Disappointed Christian'. I'm not angry - I can't be bothered. I'm not depressed - got good friends and family. But I just can't shake off this ever-present feeling of 'Vague Disappointment' with life, the universe and Christendom. Thanks for indulging me in my caffeine-fuelled postings. I'm not always like this, honest. Heady days. 1984. The best of times - no doubt about it. We laughed; we smiled; we prayed in tongues. I wish I could go back, but that’s not possible now. The bubble has burst and all I have are my memories. Great, fantastic memories. 19 years old. Based in the south of England, living with a group of Christians who were young, without any money. But we had each other and the Holy Spirit. And the deeply held belief that we were a bubble of holiness in a world going to hell in a handbasket … or any other portable receptacle you might care to mention. It was joyful being in that bubble. But with it came great responsibility: we were charged with the task of converting the world. Time was short. Jesus was coming back soon. Before that, there would be a final outpouring of the Spirit on ‘this nation’ (people in our bubble liked using phrases like ‘this nation’) which we would help to usher in by preaching very badly on the streets of London, singing tunelessly to two strummed guitars and performing short skits to a succession of passing commuters. Our humble offerings – like the lad with the few loaves and fishes – would be taken by God and multiplied a hundredfold, even the tuneless singing. Together we were standing against the world. But we had each other, and we were right in the centre of God’s perfect will. We were gonna grab as many souls as possible before God finally declared ‘FINITO’ on this miserable planet and raptured the good ‘uns up to heaven while leaving the bad ‘uns to the bottomless appetite of the slavering hornéd beast – or the head of the Common Market, depending on which Christian paperback you happened to be reading at the time. Many years later I found myself in Eastbourne (as you do) when a group of local churches were holding a March For Jesus, with banners, gospel tracts and slightly better singing than our efforts in ‘84 – all in the middle of a busy, Saturday-morning shopping centre. Another bubble in action: joyful Christians, marching against the world, reclaiming the Eastbourne pavements from Satan’s kingdom to God’s. I didn’t join them that morning, but I was curious to see the effects of all their marching, pronouncing, praying and months of preparation. I genuinely wanted to see changed lives on the street, shoppers crying after being overpowered by God’s love, halos miraculously appearing above the heads of traffic wardens. You know what I saw when I got into town? Business as usual. Tired, stressed shoppers flitting from one consumer experience to another. The only difference to be seen was hundreds of March For Jesus leaflets scattered on the floor, soiled by dirty footprints. Life went on … same as it ever was. I guess I was hoping for another bubble to join, but I knew then, beyond any doubt, that it was over. Like it or not, I am part of this world, not against it. I am bound up in this common adventure called humanity – ever-evolving as time marches on, as it always has done, year after decade after century. The world doesn’t belong to Satan. It has its good bits and its bad bits, just like I do. Do I want this world to end? No. Do I want the human race to reach the next stage in human consciousness so that it connects better with God, creation and itself? You bet I do. 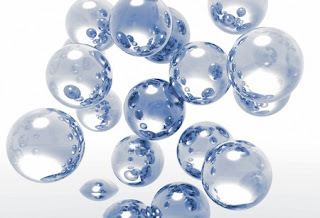 But it’s not going to happen if we stay in our bubbles. It might be nice and cosy in there, but all bubbles burst eventually, so why not get it over and done with and join this planet we live on? It’s not as black and white out here … but then I’d rather have colour any day. I blame the rot on Play School. The BBC broadcast this cheap and cheerful children's show from April 1964 to March 1988. Recently it was revived as Tikkabilla, which means - unfortunately - that the sad, heinous conspiracy continues. As it happens, I was born in July 1964, just weeks after Play School was launched on a generation of unsuspecting toddlers. I can pinpoint Play School as the exact root of my lifelong feeling of 'Vague Disappointment' with the world. Beware Tikkabilla - it is planting seeds of disillusionment in your children that may only come to fruition in 10, 20, 30 years' time. Don't say I didn't warn you. It's the windows, see. The round window. The square window. The arched window. The ritual of Play School included the regular occurrence of a camera zooming - seemingly at random - through one of these windows to reveal a short, jolly three-minute film about everyday life. As a consequence, the world is a swimmingly wonderful place that ticks along just nicely. Can you see the problem? A big fat 'No way, José' to all three. The world's not like that. Never has been. And anyone who tells you otherwise is starting you on that slippery slope to 'Vague Disappointment' ... either that, or encouraging you to develop increasingly complex skills of self-deception in order to keep your fragile worldview together, because the alternative is just far too unbearable. Now that I am 43, the windows have changed but they are still there. My current windows are stained-glass ones, and, like the Play School windows, they come with a set of promises and expectations that just don't mesh with the world I see around me. I don't like this. I don't take pleasure in feeling this way. I want the world to be like I was told it was - by Brian Cant, by Derek Griffiths, by that female presenter who was good at miming elephants, by a succession of authority figures speaking in the name of God and the BBC. 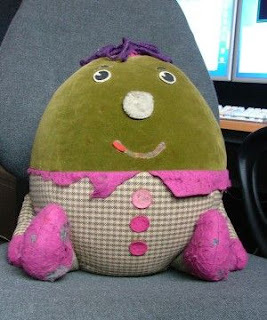 Many of the original Play School toys - Humpty Dumpty and the others - now reside in a glass display case in the National Media Museum in Bradford. I propose that a group of us frequent the place one Saturday, dutifully line up in front of these iconic mouthpieces of the establishment - Hamble, Jemima, the whole pathetic lot of 'em - then all as one scream and hurl abuse at them from deep within our primal beings. It won't achieve anything, but it might be therapeutic. And as we are forcefully escorted out of the museum by the security guards for scaring the punters, we will emerge renewed and refreshed into the streets of a world that is real and alive and bursting with contradictions - not the made-up world we were lied to about. Anyone care to join me? I'm happy to provide sandwiches. We've been working in comics for over 30 years and started collaborating 20 years ago. Between us we've written and drawn characters such as Spider-Man, Desperate Dan, Transformers, Bananaman, The Bash Street Kids, The Tick, Count Duckula, Do-Do Man, Savage Sidney, Shaun the Sheep, and many, many more. Wooding writes; Kazybrid writes and draws.